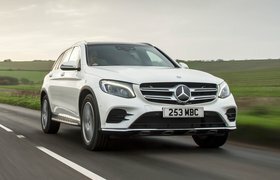 2018 Mercedes-AMG GLC 63 S review – price, specs and release date | What Car? What’s the point of an SUV? If the marketing teams of numerous manufacturers are to be believed, they offer a commanding view of the road, all-weather dependability (assuming you’ve got four-wheel drive) and plenty of space for friends, family and all their lifestyle accessories. 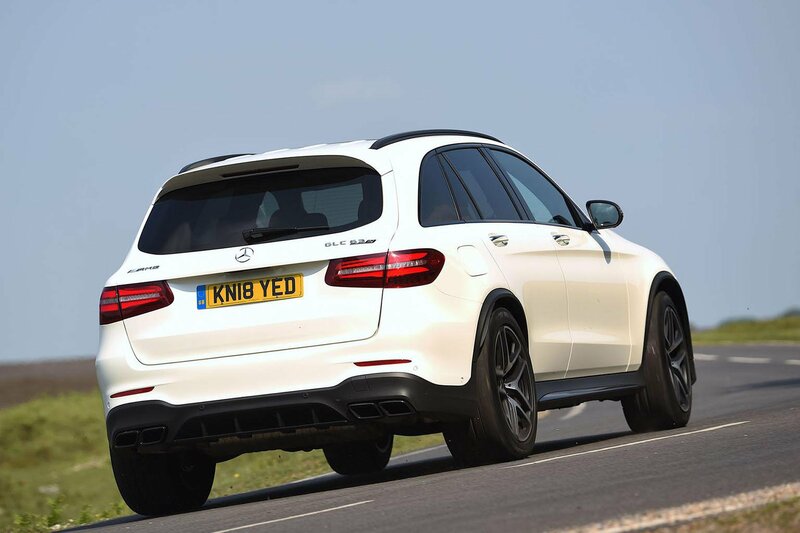 The Mercedes-AMG GLC 63 S adds one more thing to that list: neck-snapping acceleration. You see, this very GLC 63 S clocked up the fastest 0-60mph and 0-100mph times of any SUV we’ve tested. If you’re a Top Trumps fan, the numbers are 3.6sec and 9.0sec – figures that put it well ahead of the slices of Italian exotica that adorned teenage boys’ walls throughout the 1980s and 1990s. As with other 63-badged Mercedes-AMG cars, the motive force is provided by a 4.0-litre twin-turbocharged V8 that, in this application, delivers 503bhp and a monster 516Ib ft of torque to all four wheels. No wonder this two-tonne-plus SUV is so darn fast. Thumb the V8’s starter button and it grumbles menacingly into life, making clear the level of firepower under the bonnet. But slide the GLC into drive and you’ll soon find the engine is happy to slip into the background during cruising conditions. Indeed, at 70mph, the main thing bothering your eardrums will be the wide tyres roaring over coarse road surfaces. It’s also worth mentioning that, while the ride is largely comfortable, you’re left in no doubt that this is a performance car when you go over scarred surfaces. But a good bootful of accelerator soon wakes the V8 up. It pulls well from low down in the rev range, but it really gets going as the needle passes 3000-3500rpm, providing acceleration that is downright shocking all the way up to the 7000rpm limiter. The noise is tremendous, but it can be made truly thunderous with an optional £1000 AMG sports exhaust. The handling impresses on the road, too. The steering may be a bit inconsistent in its weighting and response, but you soon learn to place the nose of the GLC accurately enough. Air suspension is standard and can be stiffened, should you fancy some spirited cornering. This not only limits body lean, but also keeps the GLC’s hefty mass better in check over rippling roads. 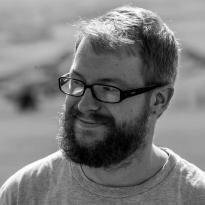 Most people can pretty much stop reading about the driving impressions here. You see, while the GLC is good fun up to a point and will even let you slide around a little at low speeds, it all falls apart on track. The problem is the stability control system; it’s fine within the limits of grip, but start to lean against these and you’ll feel it grabbing the brakes to keep you on the straight and narrow. It's far too keen to intervene and so is counter-productive if you know what you’re doing. Like we say, though, it’s unlikely that the vast majority of road-only drivers will ever get up to this point. All GLC 63 S cars get an AMG makeover for the interior, including electrically adjustable figure-hugging sports seats in nappa leather, a flat-bottomed sports steering wheel with gearshift paddles and adjustable ambient lighting. It’s an appealing interior, but one that can’t quite match the Porsche Macan for build quality. There’s a good chance that, if you’re thinking about one of these, passenger and luggage space will be a serious consideration. In that respect, it beats the Macan but lacks some of the flexibility of the Audi SQ5. 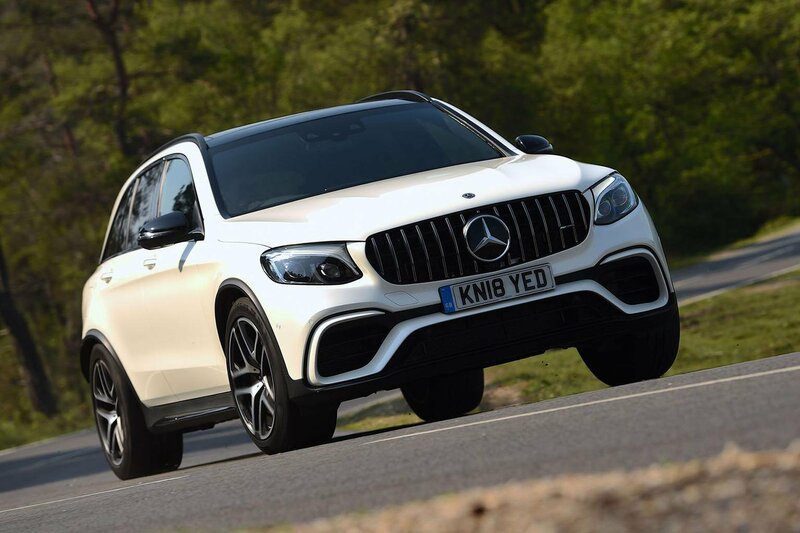 For the full lowdown, check out our 16-point review of the standard GLC here.